Today’s post was written by Dave Del Gobbo, science and special education teacher at the Stephen Lewis Secondary School in Mississauga, Ontario. In September of 2013, I had the opportunity to visit a tech design class taught by my good friend, Cam Watt, at a neighboring high school. His after-school “Maker Club” had finished assembling a 3D printer from a kit and was starting to experiment with it. The 3D printer, controlled by a laptop, was laying down layer after layer of molten plastic until a 3D figure slowly took shape. As I held this newly formed object in my hands, I knew immediately that I wanted to incorporate 3D printing into my teaching practice. I also realized that I would need powerful and flexible tools for my students to be successful. Historically, students use 3D printers to slightly tweak existing designs from websites like www.thingiverse.com. If students could be inspired to design totally unique objects for real-life purposes, their learning would be accelerated. 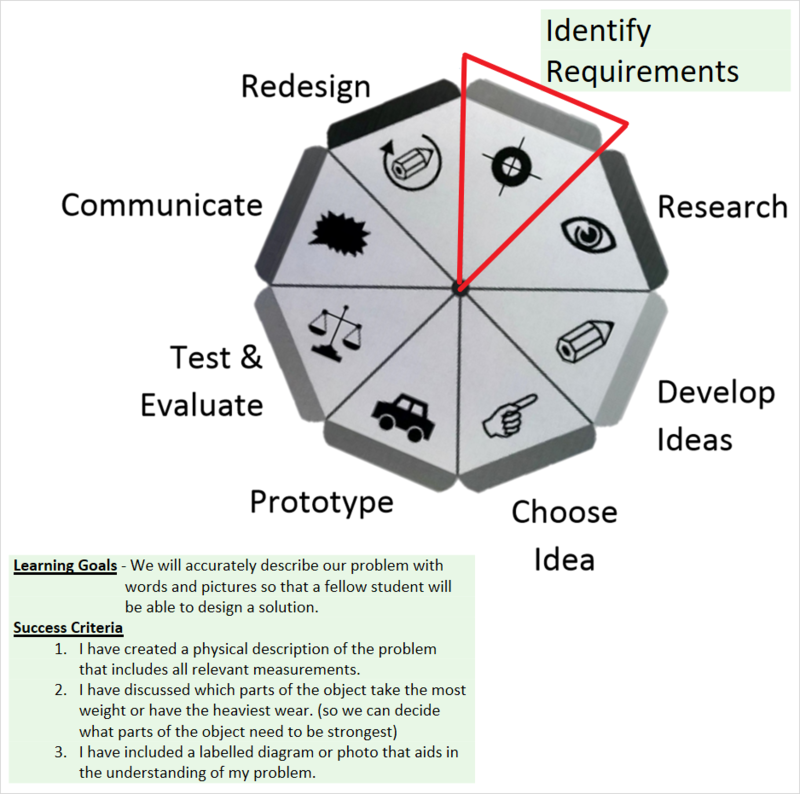 Designing objects from scratch is extremely challenging, so a creative and critical design process is needed to guide all efforts. Cam used a similar design process when his senior students created works of art. I wanted my younger students to work through a similar collaborative framework while making their thinking visible to me. Using linear online collaborative tools that had restrictions on page size would make it challenging to capture dynamic student thinking. Graphic organizers are educational tools that have been traditionally used to help students visualize complex concepts. Handmade graphic organizers can be limited by a student’s own dexterity. With OneNote, a graphic organizer has no size limits, so you are free to zoom in for further detail, and they can be continually modified as a student gains proficiency and expertise. 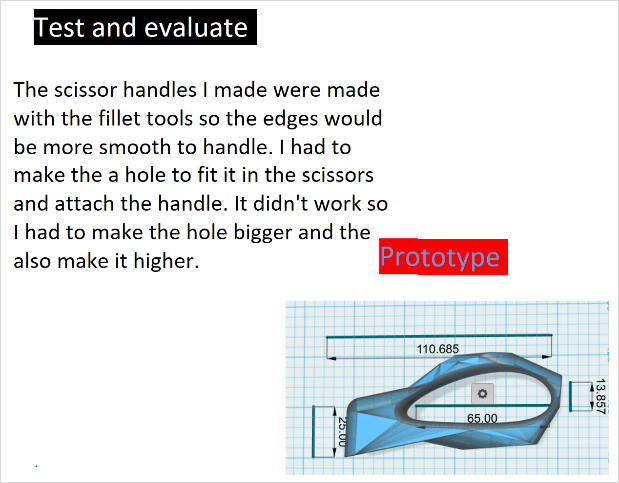 In a OneNote collaborative notebook, students listed household problems that they thought could be solved through 3D printing and then had fellow classmates sign up to solve a specific problem. Many problems that seemed simple on the surface were not. For example, a replacement handle on a broken pair of scissors has much hidden complexity. For the new handle to function properly, students would need exact measurements, excellent mathematical skills and a knowledge of ergonomics. 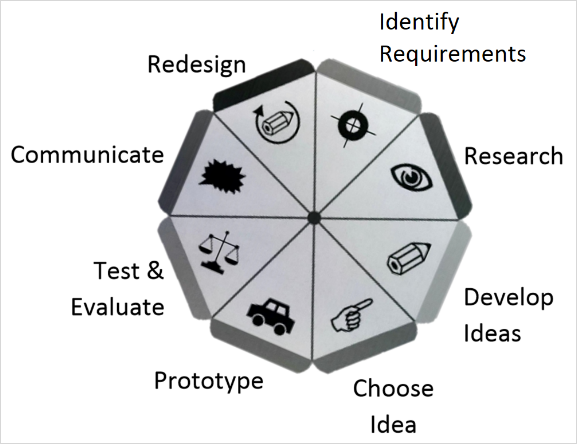 The design process ultimately took the form of a pie-shaped graphic organizer that students gradually filled in with their learning journey. Each “step” of the organizer was facilitated by the teacher in the form of a OneNote Class Notebook page, which was “pushed” into their design notebooks. As students completed each section, their work was posted along each “slice” of their master graphic organizer. Students were never limited to text when completing the requirements for each part of their organizer. They included pictures from their devices, video, audio feedback and sometimes 3D files for review. Before long, their design organizers became populated with evidence of the choices made during the design process. 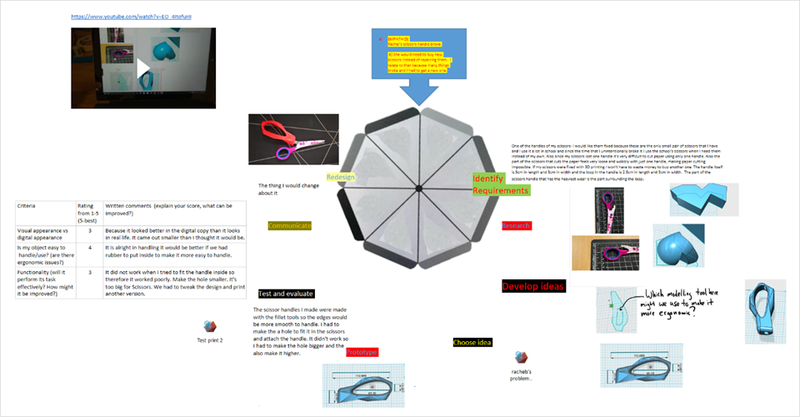 OneNote, with its inherent flexibility, allowed my students to visually present their evidence of learning in a nonlinear fashion and to tackle an extremely complex task. 3D printing is a challenging field to explore in the classroom, and I would urge that you not get discouraged by tiny failures; rather, view them as opportunities to model conscientiousness in front of your students.